Club Bameso (TBS) tabbed 26-year old American ex-international guard Anthony McDonald (185-82kg-92, college: N.C.Central). 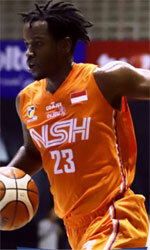 He played recently at played at Bima Perkasa in Indonesian IBL league. In 15 games he averaged impressive 23.0ppg, 5.0rpg, 5.1apg and 1.1spg this season. He can count that year as a very successful as was selected to Indonesian All-Star Game. The last summer McDonald played at Libreville Izobe Dragons (CBL) in Gabonese league. Among other achievements his team won MEAC Regular Season in 2015. McDonald received also All-MEAC 2nd Team award back in 2015 at his college time. McDonald was a member of USA Senior National Team in 2015. He has played also professionally in Spain (Villarrobledo). McDonald attended N.Carolina Central until 2015 and it is his third season in pro basketball.